Arr, mateys! We be pirates, sailing the high seas in search of Loot. We play cards to capture or defend merchant ships. Loot is one of the earliest games from designer Reiner Knizia. It’s been available in the United States since 2005 from publisher GameWright, but the newest version has updated artwork and comes in a metal tin. Every pirate is out for themselves and the battles can take surprising turns. Let’s look at how to capture ships, win gold, and control the high seas. 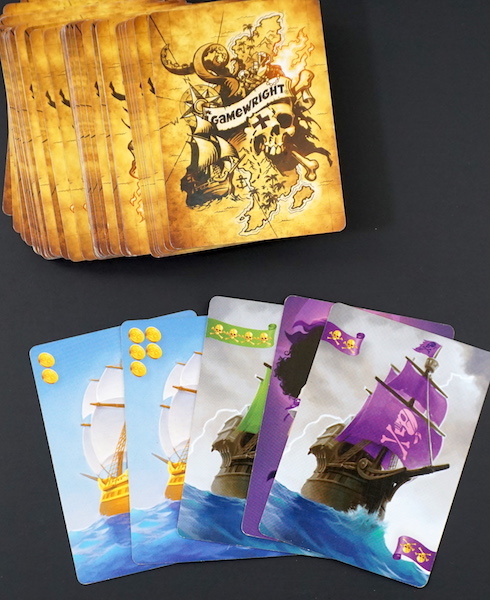 Loot consists entirely of three kinds of cards: merchant ships, where the gold is; pirate ships, which are used to attack and capture merchant ships; and the six trump cards, which are five pirate captains and an admiral. But the way you use these cards make the game interesting. The game centers around capturing merchant ships, either from other players or those that you play in front of you. 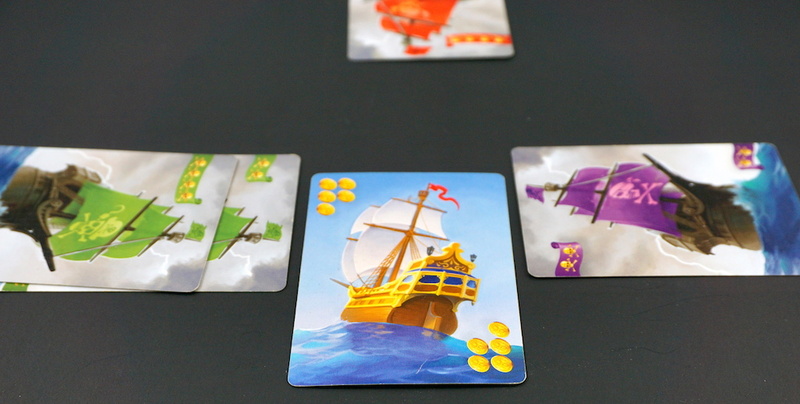 Whatever merchant ship is played, all players have the opportunity to attack it with the pirate ship of any color they choose. But once a pirate ship is played, any following player must choose a different color. Even the player who played the merchant ship can capture it themselves by using a pirate ship. Anytime a merchant ship is not attacked, the player who first put it down can claim it when it becomes their turn again. Each turn, the current player checks to see if any of the played merchant ships can be claimed. A ship can be claimed if the current player has the strongest pirate ships, the last trump card, or a ship no one has attacked. That ship then goes into that player’s score pile. After checking for ships to claim, the action portion of the turn happens. Players have the options of putting down a merchant ship, or attacking an existing merchant ship every turn. They can also play a pirate captain if they already played a pirate ship of that color or place the Admiral on their own merchant ship for defense. The captains and admirals work as trumps, because the last card played wins. Other actions allowed are to draw a card or discard a card (discarding is most important and strategic at the end of the game). The game ends when the draw pile is gone and one player is out of cards. Each player’s final scoring is the gold value of all the captured merchant ships minus the gold of merchant ships in a player’s hand. Now you’ll see who’s the best pirate around! Loot isn’t complicated, but each game is exciting. There are multiple things that work together to keep things lively. Every turn, you must balance attacks on others with playing your own merchant ships is important. Playing your high value cards when someone else also has high value cards out is usually best as you try to split players’ attention, but then you have less chance to get those other cards. Assessing the value of each card based on the current play situation is key to capturing ships and getting a good score at the end of game. When will the Captains appear? In the final scoring, merchant ships still in a player’s hand are counted as negatives, so playing them before the game end is best, but keeping them out of other player’s hands is good, too. But you can’t be sure when the game will end, so it can come as a surprise. When the Pirate captains and the Admiral appear is also exciting. 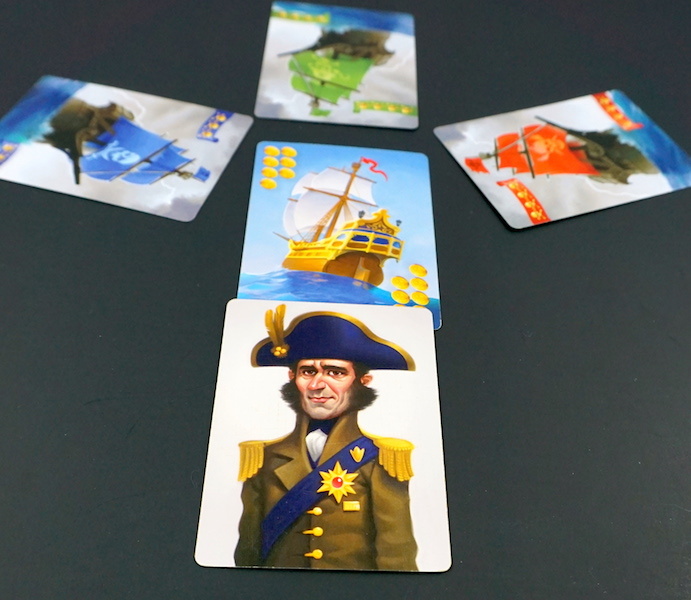 With four colors of pirate ships and only one captain in each color, waiting for those cards can be riveting. Is this the turn those cards will appear? Will other players play Captain cards to over-trump? Depending on the number of players, the game changes noticeably. With each additional player, rounds become more chaotic. More happens all at once: more merchant ships being played, more pirate ships attacking. In addition, the draw deck is depleted faster so the game ends sooner. It’s more intense with more players, but shorter. Less players is less chaotic and lasts longer. Playing with teams also changes the game, because the players coordinate by looking at each other’s cards and working together to attack and defend. And with two players per team, you have to plan differently compared to just one player out for themselves. Loot isn’t overly simple, but once you’ve played for a few minutes, the choices become clear: attack, defend, play a merchant ship, draw, or discard a card. The focus on a few main actions leads to solid gameplay that appeals across ages. There is no reading required, only simple counting and comparison, making this a great game for younger children or multi-lingual groups. 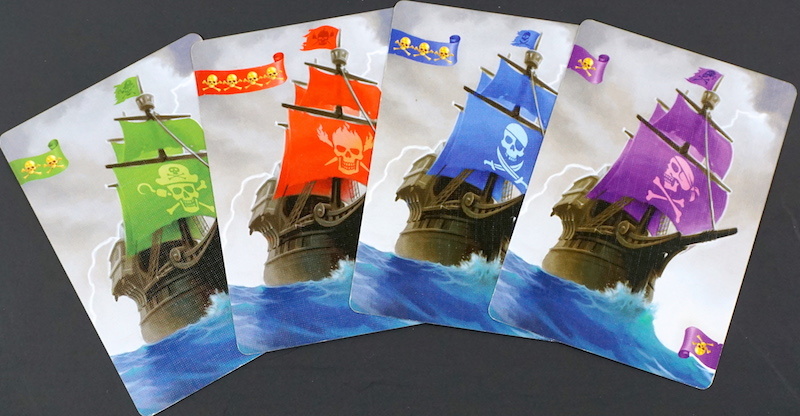 The four colors are distinct in the newest version, and the cards also use different symbols for the four pirate groups. Row your boat over to Amazon, and grab yourself some Loot today! 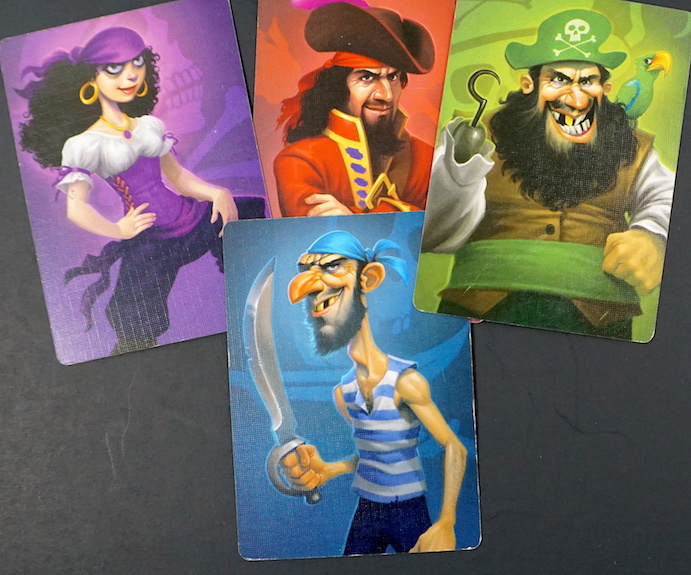 GameWright provided The Family Gamers with a complimentary review copy of Loot.